PORTLAND, Ore. (CNS) — An Oregon priest who became an apostle of calligraphy, even teaching the ancient art to Steve Jobs at Reed College, has died at age 83. Father Robert Palladino, a longtime heart patient, died Feb. 26, doing his work even in later years. His pieces hang framed in the dens and living rooms of many Oregon Catholics. The priest melded Latin, English and Hebrew letters in ways meant to show the vitality and universality of Scriptures. “I do things that inspire me in the hope that they may inspire someone else,” the priest told the Catholic Sentinel in 2011. The funeral Mass for Father Palladino was to be said March 11 at St. Mary’s Cathedral in Portland with Archbishop Alexander K. Sample of Portland as the celebrant. Father Palladino also was a parish priest serving outside Portland and often traveled to the city to say Masses in Latin. He was a former Trappist monk, a widower, a parent and a lover of Gregorian chant. He grew up in Albuquerque, New Mexico, and was an altar server from the fourth grade on. He joined the Trappists in New Mexico at age 17 and moved with them to Oregon in 1955. The young monk learned calligraphy and Gregorian chant from his Trappist mentors. He was ordained in 1958. After Latin chant was replaced, Father Palladino thought the Scripture texts were not being expressed as well as they ought. Other parts of Trappist life were changing. In 1968, he left the Trappists, married the lead clarinetist in the Oregon Symphony and had a son, Eric. 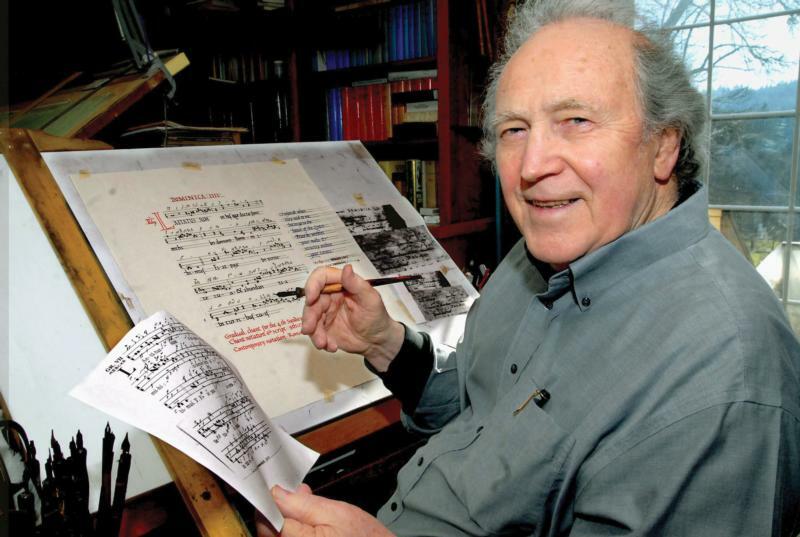 He began teaching calligraphy and ancient scripts at Reed. That’s when he met Jobs, who credited the former monk for inspiring a passion for fonts that made Apple computers unique in the 1980s. Father Palladino and his wife, Catherine, purchased a farm near Sandy and raised sheep. Catherine died in 1987. After years of mourning, he heard of a need for priests and became a priest of the Archdiocese of Portland. He served for a decade at St. John Church in Welches and St. Aloysius Church in Estacada, two small parishes in the foothills of Mount Hood. Jean Germano, an Oregon Catholic artist, took a class from Father Palladino 25 years ago and remained a friend. Those who got letters from Father Palladino knew he used stunning italics in everyday communications. Fewer know that when they power up their iPads and iPhones, the priest’s sense of beauty is reflected there, too. Langlois is a staff writer at the Catholic Sentinel, newspaper of the Archdiocese of Oregon.